Bacon is simply one of the most delicious foods on the planet and absolutely nothing beats homemade! Learning how to make bacon is easy and you will be positively thrilled at the results! …I love thee with the breath, smiles, tears, of all my life…. Okay, yes, Elizabeth Barrett Browning really wrote that poem for her husband, Robert. Not for a piece of cured pork. But really, can anyone prove that bacon wasn’t the object of her affection? Exactly. When it comes to bacon you just can’t beat homemade. You have full control over every element: The quality of the pork, the seasonings used, the curing method, the type of wood chips/smoke, the thickness of the slices. There’s no mystery when it comes to making bacon. It is simple and easy and even those minor efforts pay off BIG time! Before we get to how to make bacon, let’s address a couple of the most common questions: Should I dry cure or should I wet cure the bacon? What about those nitrates/nitrites? Should I dry cure or should I wet cure the bacon? Some experts insist dry-curing results in a more pronounced flavor and that the bacon fries up more crispy than when using the wet-curing method. Other experts insist on the exact opposite. The battle rages on. 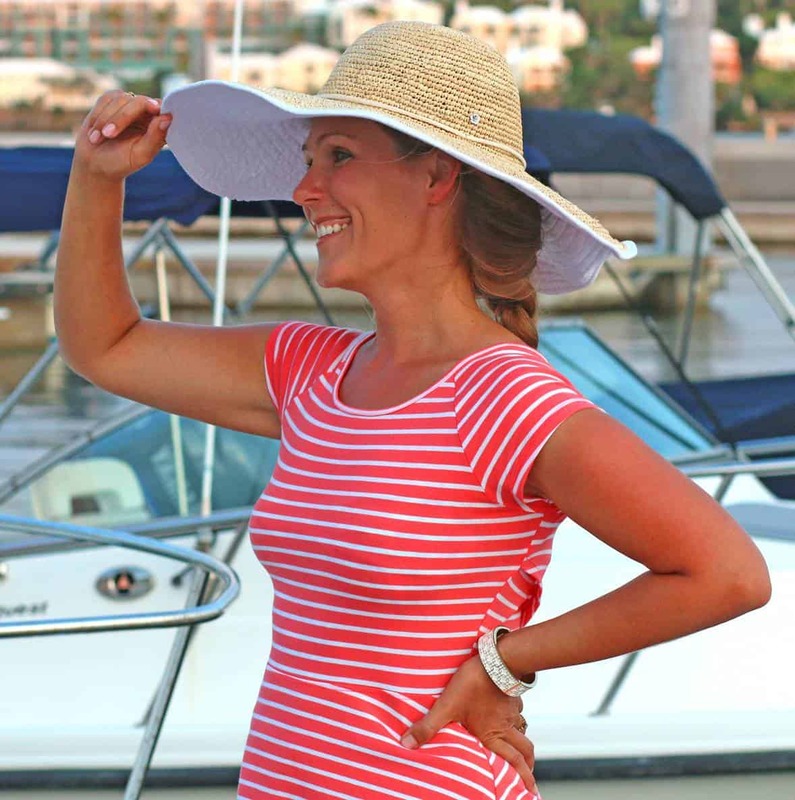 The bottom line is that it comes down to personal interpretation and preference. I’ve used both methods, they both yield excellent results, but I tend to lean on the side of dry-curing. I’m including both methods for you to try. Pick one or the other or try them both and see which one you prefer. Now for the next question. Nitrates and nitrites get a bad rap and are commonly associated with processed deli meats, hot dogs and bacon. But they may be one of many examples of things that have been targeted and blown out of proportion by the media. As is typical of medical research, there are so many conflicting studies on this topic with directly opposing conclusions that it’s enough to make one’s head spin. Though the opponents to nitrates may argue, the fact is there is no definitive conclusion one way or the other. Another source notes, “those uncured hot dogs or bacon you’ve been conscientiously paying more for? Most are processed using celery or beet juice, whose nitrates turn into nitrites when they react with the saliva in your mouth [and] in many case…contain more nitrites than traditionally cured meats.” The claim to be made “without nitrates or nitrites” is a marketing ploy, and the use of celery or beet juice is the FDA loophole that allows them to make that erroneous claim. Now I would never make the claim that bacon is healthy. Nor would I say that it’s perfectly safe to eat an unlimited amount of nitrates and nitrites. But I do personally maintain that a balanced diet that includes “all things in moderation” is a sound and a safe one. So the question becomes less one of should I use nitrates/nitrites, and instead is one of why should I use them? And the answer to that is the same one that people made 12,000 years ago when they found that meat remained safe to eat when they used it. Bacon is smoked low and slow within a temperature zone that bacteria can grow and multiply. 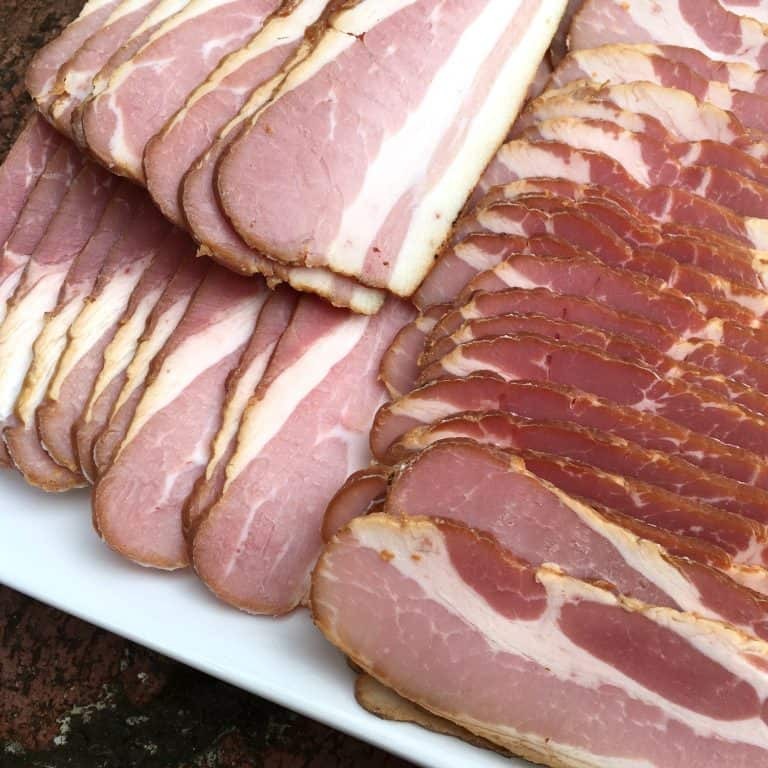 The use of nitrites in bacon fights harmful bacteria and it also helps preserve the meat’s color. 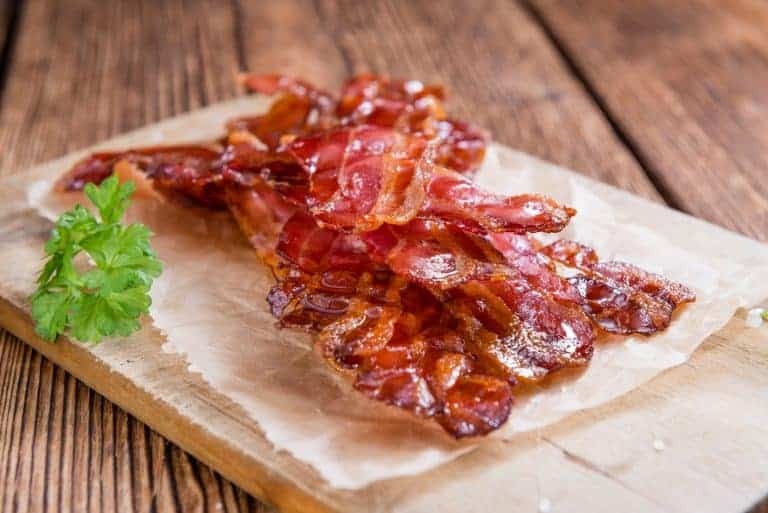 (Imagine grayish-brown bacon or hot dogs…now you know why those manufacturers of “nitrate/nitrite-free” meats still sneak them in, just under a different name.) So nitrates and nitrates help ensure both the safety of the meat as well as it’s pleasing aesthetics. And the flavor and aesthetics of bacon are very pleasing indeed! But let’s stop the talking and let’s start smoking! Ladies and gents, it’s time to make some homemade BACON! As promised, I’m giving you both options for DIY bacon to choose from. Better yet, try both and see which one you prefer. Add all the cure ingredients together in a large bowl and stir. Place the pork belly in gallon ziplock bag or container that just fits the size of the pork belly and pour the brine over it. If using a ziplock bag, place the bag in a container in case there is any leakage. Place it in the refrigerator for 7 days, flipping the bag over (or the pork belly itself if curing it in a container) every 2 days to ensure both sides of the pork belly are equally cured. **A one-gallon bag will hold a 3-pound pork belly. If you’re following the recipe to use a 5 pound pork belly and plan on using the wet cure method with ziplock bags you can cut the pork belly in half and divide the brine equally between the two bags. After 7 days the pork belly will have firmed up. Remove the pork belly from the brine and thoroughly rinse it off. Some people say you should let the slab of bacon air dry for up to 24 hours before you smoke it. But many experts agree there is no need to do this. 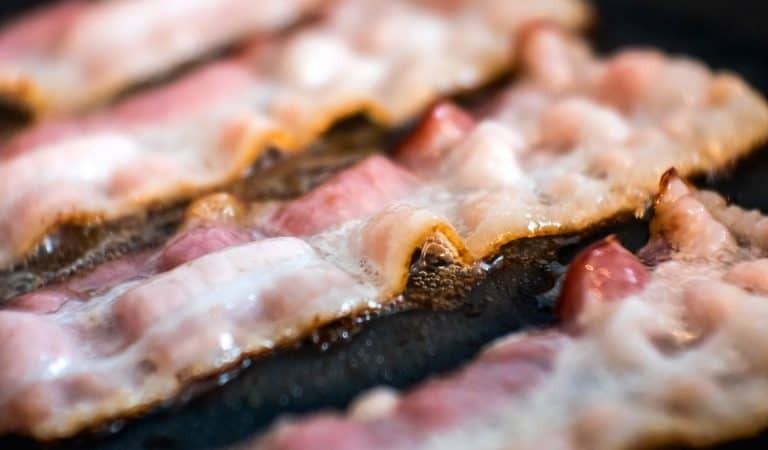 These experts argue that in leaving it wet the smoke actually sticks to the bacon better than if it’s dry. At this point if you like you can rub it down with some cracked peppercorns and, if you want it sweeter, some brown sugar, honey or maple syrup. Place all the dry cure ingredients in bowl and stir to thoroughly combine them. It is essential that the pink curing salt is evenly distributed across the whole pork belly. So I like to give the rub a quick buzz through a spice/coffee grinder or you can use a small blender or a mortar and pestle. Thoroughly and evenly rub down all sides of the pork belly with the dry rub. Place it in a ziplock bag or container (I’m using a casserole dish), with the fatty layer side down, and cover it with plastic wrap. Refrigerate it for 5 days. Flip the bacon over, redistribute the liquid that will have formed (if it’s in a ziplock bag simply turn the bag over and give it a good massage), and refrigerate for another 5 days. After 10 days the pork belly will have become quite firm and stiff. Remove it from the the container or bag and proceed to smoking. Whether you’re using the wet or the dry curing method, the next step for smoking the bacon is the same. 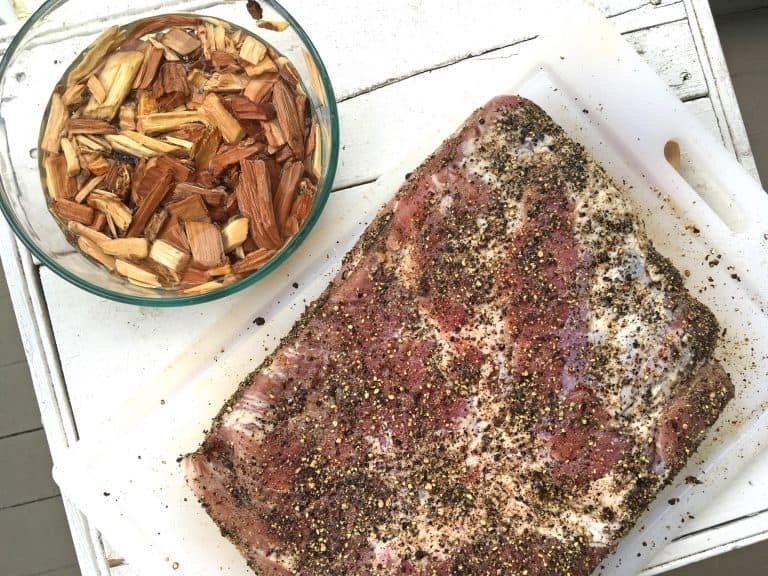 As already mentioned, it’s also at this point that you can also sprinkle some coarsely ground pepper (if using) onto your wet-brined pork belly and “top off” the pepper on your dry-cured pork belly. You can also sprinkle on some extra brown sugar, maple syrup or honey. Prepare the wood chips by soaking them for at least 30 minutes. Preheat your smoker to 175-180 degrees F (do not exceed 200 F). I’ve used the Masterbuilt Digital Smoker the past 3 years. I love and highly recommend it. You can buy it online buy it online HERE. You can check out my full review HERE. Smoke the bacon for 3+ hours or until the internal temperature of the bacon reaches 150 degrees F. Add a handful of wood chips a couple of times during the smoking process. If you’re using a grill, set up it up for 2-zone cooking and smoke the bacon over indirect heat at 175-180 degrees F (don’t exceed 200 F) for about 3 hours or until the internal temperature of the bacon reaches 150 degrees F. Add a handful of wood chips a couple of times during the smoking process. You’ll need an instant read thermometer. We use and recommend this one. What kind of wood chips to use? This comes down to personal preference. Hickory is the tried and true gold standard but cherry and apple are also excellent. Once the bacon reaches an internal temperature of 150 degrees F, transfer the bacon to a plate and immediately place it in the fridge to cool down. All you really need is a good sharp knife. But if you want those perfectly uniform, professional slices of bacon, you’ll need a meat slicer. Whichever you use, always slice across the grain. We found our 1970’s commercial Hobart slicer ten years ago on Craigslist. It has some imperfections to be sure, but it was a steal of a deal. For a meat slicer that won’t break the budget and that has excellent reviews, check out the Chef’s Choice Electric Meat Slicer. 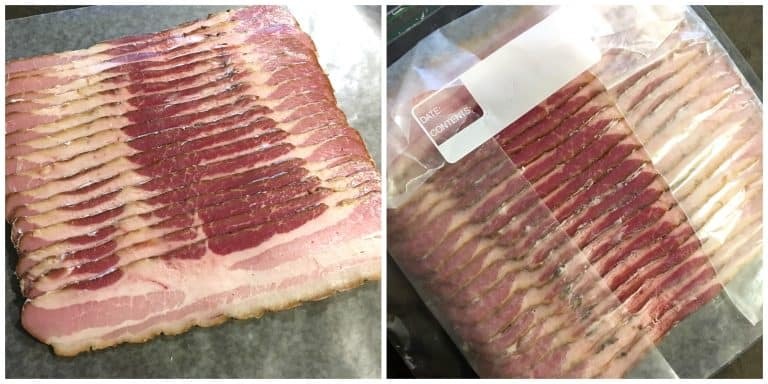 If you plan on using the bacon within 2 weeks, wrap it in several layers of plastic wrap followed by an outer layer of foil and keep it refrigerated. If you’re not going to use it within 2 weeks you can freeze it for up to 3 months. To Freeze the Bacon: You can either use a vacuum sealer like Food Saver that will ensure its freshness, or you can do what I do (because my bacon never lasts beyond a couple of months anyway before it’s gobbled up): Lay the slices out on wax paper in the same fashion as store-bought bacon and place another sheet of wax paper over it. Fold the sides around the bacon. Place the wrapped bacon in a ziplock bag. I usually freeze the bacon in small amounts, the amount I know I usually need for one use. If you prefer the pieces not to stick together you can cut strips of was paper and place them between each slice of bacon. When you’re ready to use it, simply remove the bacon from the freezer and let it thaw. With your homemade bacon ready to go, now it’s time to EAT IT! 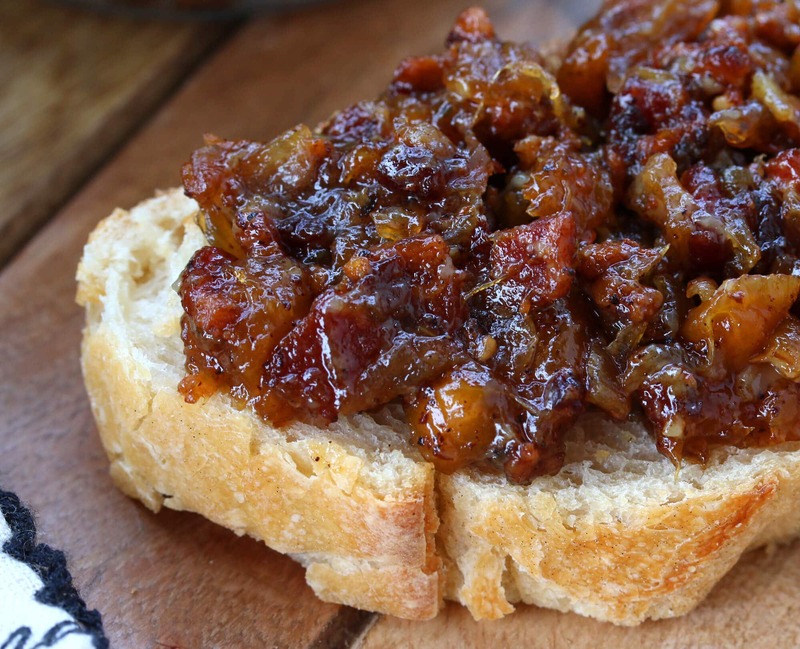 Be sure to check out our recipe for some incredible Peach Bacon Jam! 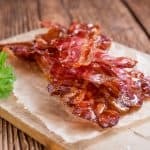 A comprehensive tutorial with step-by-step pictures on how to make your own AMAZING bacon using either the wet brine or the dry cure method! **A one-gallon bag will hold a 3-pound pork belly. 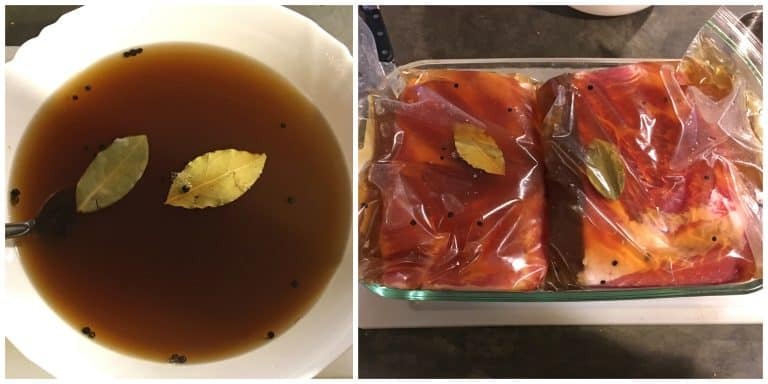 If you're following the recipe to use a 5 pound pork belly and plan on using the wet cure method with ziplock bags you can cut the pork belly in half and divide the brine equally between the two bags. After 7 days the pork belly will have firmed up. Remove the pork belly from the brine and thoroughly rinse it off. 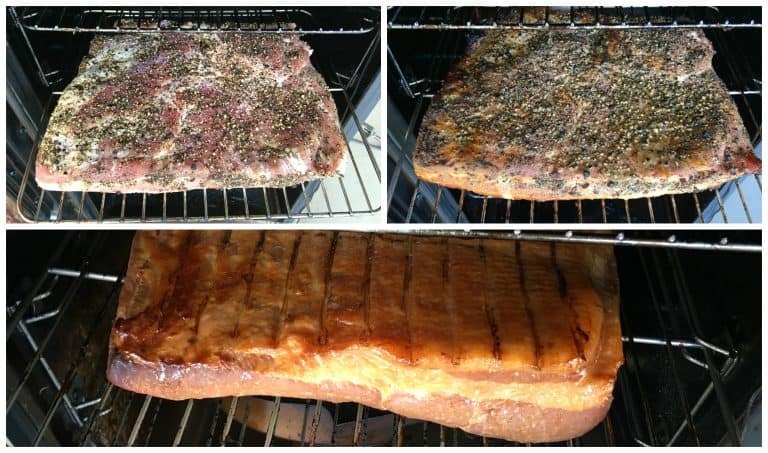 Some people say you should let the slab of bacon air dry for up to 24 hours before you smoke it. But many experts agree there is no need to do this. These experts argue that in leaving it wet the smoke actually sticks to the bacon better than if it's dry. At this point if you like you can rub it down with some cracked peppercorns and, if you want it sweeter, some brown sugar, honey or maple syrup. Proceed to smoking (see below). Place all the dry cure ingredients in bowl and stir to thoroughly combine them. It is essential that the pink curing salt is evenly distributed across the whole pork belly. We recommend using a spice/coffee grinder, a small blender or a mortar and pestle. Thoroughly and evenly rub down all sides of the pork belly with the dry rub. Place it in a ziplock bag or container (like a casserole dish), with the fatty layer side down, and cover it with plastic wrap. Refrigerate it for 5 days. Flip the bacon over, redistribute the liquid that will have formed (if it's in a ziplock bag simply turn the bag over and give it a massage), and refrigerate for another 5 days. After 10 days the pork belly will have become quite firm and stiff. Remove it from the the container or bag and proceed to smoking. If you're using a grill, set up it up for 2-zone cooking and smoke the bacon over indirect heat at 175-180 degrees F (don't exceed 200 F) for about 3 hours or until the internal temperature of the bacon reaches 150 degrees F.
To slice the bacon, slice it across the grain. You can use a large sharp knife or, for perfectly uniform/professional slices use a meat slicer. 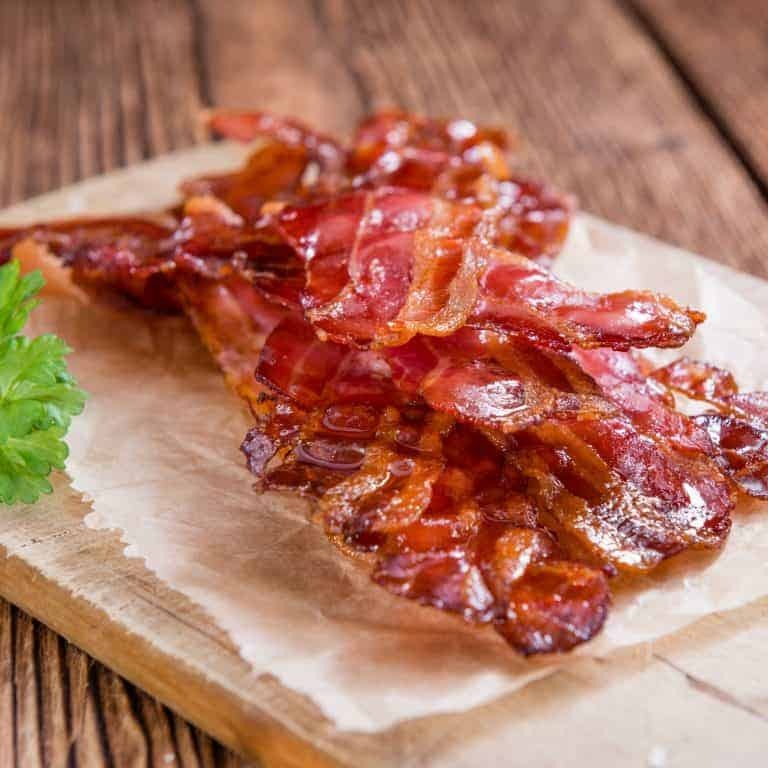 To store the bacon: If you plan on using the bacon within 2 weeks, wrap it in several layers of plastic wrap followed by an outer layer of foil and keep it refrigerated. If you're not going to use it within 2 weeks you can freeze it for up to 3 months. 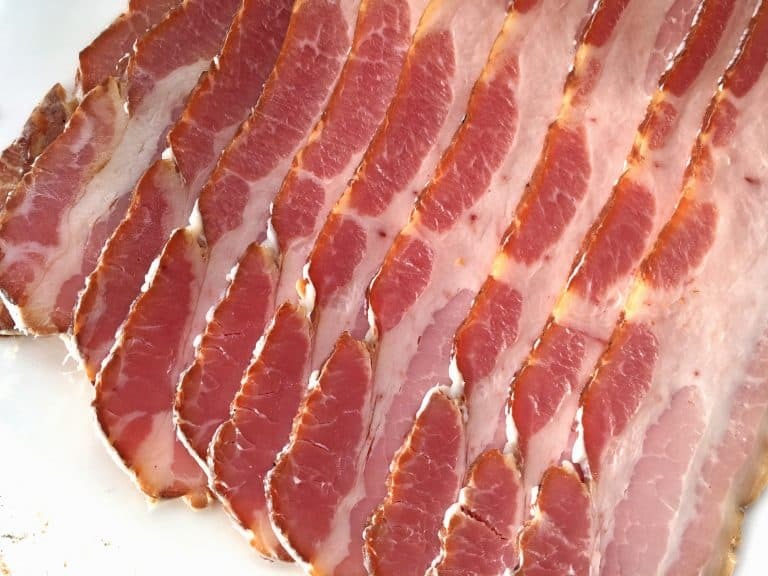 To freeze the bacon: You can either use a vacuum sealer like Food Saver or you can lay the slices out on wax paper in the same fashion as store-bought bacon and place another sheet of wax paper over it. Fold the sides around the bacon. Place the wrapped bacon in a ziplock bag. If you prefer the pieces not to stick together you can cut strips of was paper and place them between each slice of bacon. When you're ready to use it, simply remove the bacon from the freezer and let it thaw. 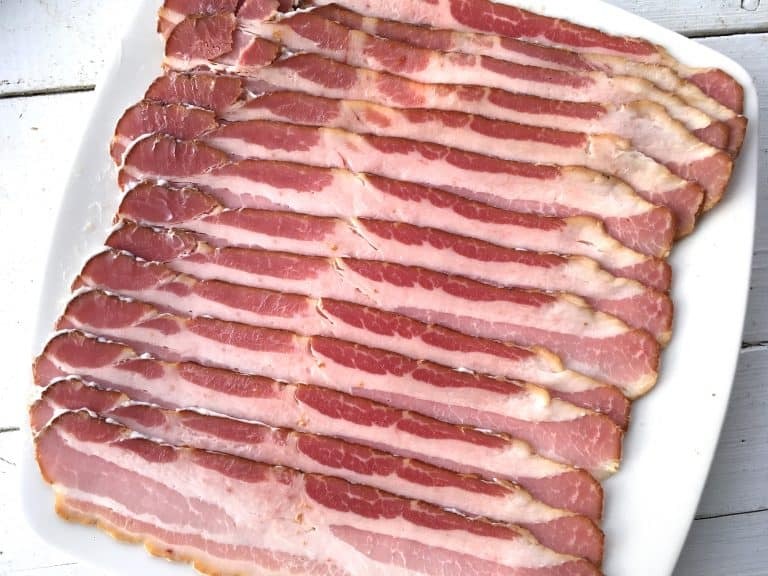 *Important Note: If you're using more than one slab of bacon do not overlap the slabs while they're curing, let them cure in a single layer. So good!! We loved it! WOW!! WAY better than store bought bacon! I LOVE bacon!! This is incredible!! This is fabulous! So good! 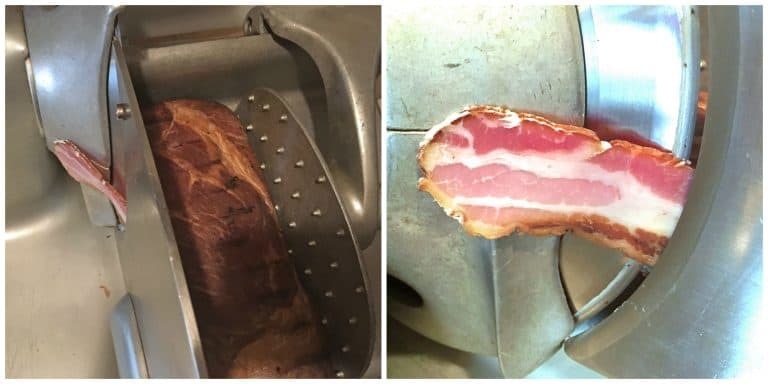 Showed this to my husband and he got so excited to make his own bacon! This looks amazing! I would eat bacon with every meal if I could! What a fun recipe to make on your own versus the store bought kind! The bacon looks like it was cooked perfectly! Love this so much! This may be the only way I make bacon from now on! Homemade bacon is the best! I will use your recipe next time! So this is showing my ignorance – but after this process do you still fry the bacon before you use it? Hi Elaine, yes, you use it the same way you use any bacon. BEST BACON EVER!!!! SO GOOD!!! Looks so delicious! Homemade version at it’s best! I’d love to make this for our breakfast! Is it possible to forego the brown sugar? Should that be replaced with something else? Hi Lura, no, the brown sugar is purely optional if you want a sweet bacon. You can simply omit it altogether, no replacement needed. Do you have to smoke it!? Hi Jen, you don’t “have” to smoke it but it’s the smoke that gives most bacon its characteristic flavor. Without the smoke it will largely just taste like pork belly, not bacon. What ingredient quantities would you recommend if I wanted to use half the weight of porkbelly for the cure. Thanks, Brian. Hi Brian, simply half the other ingredients. Happy curing! According to my calculation, your wet cure recipe is higher on nitrites (192ppm) than the USDA maximum (120ppm)for brine cured bacon. Hi Jon, the standard measurement is 1 teaspoon of Prague powder #1 per 5 pounds of meat: https://nchfp.uga.edu/publications/nchfp/lit_rev/cure_smoke_cure.html.